Washington, D.C.,- Flor Escapes has launched two upcoming fixed departure tours for travel this spring 2010 that feature wellness and cultural activities in Mexico’s Central Highlands. Both retreats offer a unique combination of Mexico’s fabulous lesser-known inland destinations, typical cuisine on a gourmet level, and wellness, in a deluxe format, at a very attractive price point. The Mystic Triangle tour, from March 21-27, 2010, is a 7-day tour that includes specialized explorations of three enigmatic archeological sites; Xochicalco, Malinalco, and Tepoztlán, in addition to gourmet dining, a cooking demonstration of authentic Mexican cuisine and activities such as horseback riding, a full body Amate holistic massage and more. This trip is based at Hacienda San Gabriel de Las Palmas, an authentic upscale historic hacienda turned hotel located in the state of Morelos that dates to 1529. “This tour provides guests with personalized visits to some of the most magical sites in the state of Morelos. Participants will explore magnificent cultural attractions of this region that are not well-known outside of Mexico and range from pre-Hispanic archeological sites to colonial gems to contemporary venues, such as Gaia, one of Mexico’s most famed restaurants”, comments Adriana Contreras, Founder of Take A Tour, Flor Escapes’ ground provider in Morelos, Mexico. To download a brochure with a day-to-day itinerary for the Mystic Triangle tour click on the following link. A complete day-to-day itinerary of the Bajío Discovery retreat is accessible via the Flor Escapes website. Flor Escapes fuses travel with wellness and culture to develop exclusive holistic retreats. All destinations, hotels, guides, spa treatments and healers have been specially selected to ensure that each trip be a true escape and journey to relaxation, self discovery and fun! For more information visit http://www.florescapes.com/. A group of friends in Oaxaca are creating the Responsible Tourism Fair (January 17-30), our 10th event since 2001 and a veritable model of frugality and slow travel. Visitors have a number of options, including weaver-guided walks in Teotitlán del Valle, photosafaris in public parks and authentic indigenous meals including Caldo de Piedra (Chinanteco), Maatsy (Mixe) and tamales (Zapotec-style). Self-guided treasure hunts asks foodies to try various cheeses, chocolates and mezcal. Photographers are invited to share photos in relevant Flickr Groups with prizes to be awarded at the end of the fair. 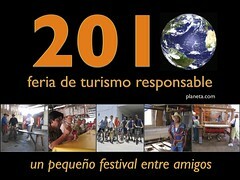 Responsible tourism is treating others the way they wish to be treated. A growing number of travelers want their journeys to be less invasive and more beneficial to the local community. They want to better understand the culture of the people they meet in the places they visit. Travelers should be mindful that they are entering a place that is someone else’s home. Interpretation begins long before the trip and ends long afterward. Those who enjoy a trip will look back fondly for the rest of their lives. The year was 1970, and I was about to turn 21. The Chicago Seven Trial was winding down, the Vietnam War was in full rage, Nixon had lowered the voting age to 18, and the Beatles had released their final album, “Let It Be.” The message to my generation was “Keep on Truckin’.” So naturally, I figured it was a good time to take a Mexico road trip.